Pretty straightforward build. 4 multiplexer output pins into the Analog in ports of the Arduino 1,2,3 and 4. Pitfalls: I have a significant voltage drop therefore I use the first pin on the first multiplexer to read the analog value and use it as a reference when mapping. myRef is read in the setup() function from 4051 chip 0, address 0. In the image the “About credit cards” page has UID=99 and has the “Hide in menu” property checked. We will use this later in the typoscript. I am using subst_elementUid property to generate the rel attribute for each A tag. Now comes the tricky part: building the contents of each slide. Next I will query all the content elements that belong to each of the pages in the result set. Look carefully at the code. You will see that the trick is to tap into the renderObject of the first query. And then use the UID field to query the content elements of each page. You may now use jQuery to bind click events to your menu and handle the content sliding with your favorite plugin. Instead of buying a replacement chip I’ve decided to get the Atmega 644P and reuse my old Duemilanove board for USB and Power. 644P has more IO pins, more program memory and more SRAM. 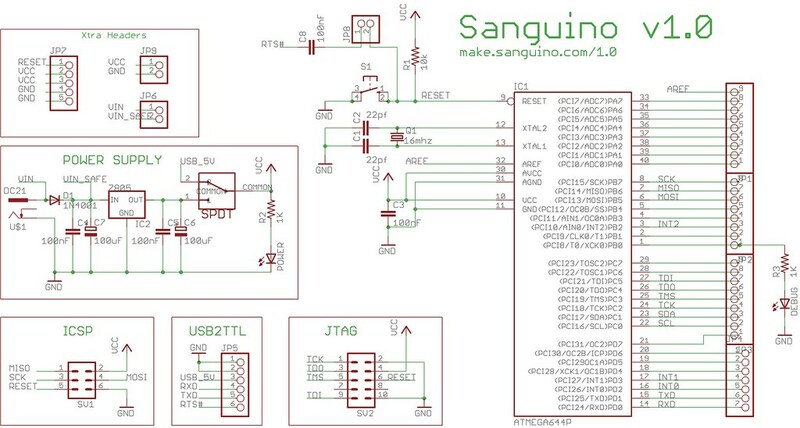 I made a Sanguino variant with an ATmega644P on a perf-board as shown here: Sanguino Schematics. I only want to power the 644P chip and have an external oscillator. This is a minimalist version without the voltage regulator circuitry and only the ICSP header. Everything will be powered and programmed by the old board. I’ve inserted an Atmega8 into the Arduino Duemilanove and flashed a Boot Loader using the BitBang method described below and uploaded the ArduinoISP sketch. After installing “avrdude-serjtag” according to the tutorial, open up a terminal and try to read the signature of the 644p chip. You can now copy the file ATMEGABOOT_644p.hex into the bin directoryof avrdude and flash it to the chip. !!! Upload the ArduinoISP sketch: Remember to upload the Examples/ArduinoISP sketch to your controller board. (You will use this to communicate with the Sanguino) This will turn your Arduino board into an avrisp programmer. You should get something like this. This guarantees a correct read. You can now flash the chip manually with avrdude or via Arduino IDE. You should get a confirmation at the end that all went well. In Arduino IDE go to Boards and select Sanguino (w ArduinoISP). Now go to Tools/Burn Bootloader/w Arduino ISP. All should go well. Here is a small modified version of the sketch to loop through all the output pins and blink them. Make sure you have AutoResetOnSerialConnection disabled and that you get a correct signature read. Or worse yet you might attempt to use the -F option and overwrite something on your main chip. Remember that if you mess up anything you can always use the ftdi bitbang method to re-flash the bootloaders to your chips. All you need to do now is to choose Sanguino(w ArduinoISP) from your boards menu and click upload. All should be OK. I almost gave up on this, but luckily I found a good solution that works for me. I own a Powerbook G4 1Ghz 1.25Gb RAM. I noticed that altough movie playback is great in VLC when it comes down to the flash player it has horrible performance. In fullscreen mode even in 360p playback youtube stutters and hangs and does a performance of around 8-12 fps on my system. Here is a step by step description of what I did. This is for Firefox so make sure you install it! What we are trying to do is to change the flash video player for Youtube only. Forcing an alternative player that is better supported by the OS. This can be either VLC or Quicktime since both players support FLV and MP4 playback. Search for the word “greasemonkey” and click “Add to firefox”. After installing this will restart your firefox. Click “install”. A window will popup allowing you to install the script. Step 3: Go to youtube.com and open a video. The flash player will initialize and will stop. A new menu will appear under every video. Click the “YWOF Prefs” button. A config screen will appear. Step 4: for default quality choose MP4 and the quiality you would like your vids to default to. I use the quicktime plugin so I chose MP4. For “player” leave “Generic”. Step 4 (Optional): If you would like to use VLC make sure you download and install VLC and the VLC Internet Plugin. You can find both for MacOS 10.4 here: http://www.videolan.org/vlc/download-macosx.html Again: only do this if you are sure you want to use VLC. I am using QuickTime. No need to do VLC unsless QT doesn’t work for you. Hope this helps. Figuring this out surely made my day since the biggest issue with my Powerbook G4 for me was the inability to use youtube. EDIT: Upon further tweaking I noticed that the VLC plugin work much better for me then QT. I have recently bought a T-Mobile G1 from a local auction site. The reason for doing so was to test my android apps on a real hardware and also to try to tap into the mind of the Android user. 1. Can I test my own android apps on the T-Mobile G1 (i am talking about the LOCKED device from T-Mobile) ? 2. Can I DEBUG my own android applications with the T-Mobile G1 ? 3. Do I need to update to a special version of the Android OS (ROOT my phone, then install a custom ROM) in order to test & debug apps on the T-Mobile G1 ? Answer: No, you don’t need to. You can enable debugging via the “settings” menu of the phone. On my G1 this setting was in Menu / [Settings] / Applications / Development / USB Debugging. I have been inactive on my blog for a long time. In this time I have managed to screw up 4 Xbox360-s with reflowing..I will give up fixing xboxes for now.. In all this time, I have been working on my new library which will definitely help out development for web applications. Soon I will post more info about the matter, but for now development is ongoing..
PHP SimpleFaces is an ajax framework built for PHP. It allows users to define interfaces via XML in a very similar manor to modern UI builders. The cool thing is that you can bind classes and methods to events on your frontend controls and you get to handle them in PHP. Although this seems like something that was done before by other libraries, in SimpleFaces you get to control all the frontend UI elements directly from within PHP. There are some demos available on the site as well an early video showing off the features. Hopefully I will release a public version in January 2010. I have successfully flashed an XBOX 360 Samsung drive (TS-H943, MS28) on a GA-MA69G-S3H using the on-board ATI SB600 SATA2 controller. I did this using JungleFlasher and iXtreme 1.6 with the half-open drive door trick. At the beginning I have tried most of the DOS flash disk methods with iPrep and XtremeBootMaker but with no success. In all cases the drive was found and recognized, but i got stuck at the 0x51 status and couldn’t get it to start reading. (the power off/on trick, nor the doors open trick) I went for the DOS boot methods because i had linux on my computer, and had no access to XP, but just when I was about to give up and buy a VIA SATA card i thought I’d give it a try with XP and see what happens. 1. I set the BIOS Sata settings to NativeIDE. 10. I saved the hacked firmware, and went back to the DVD screen and wrote(flashed) it to the drive. At the end i got the “Writing ok” message and everything was nice and cool from there. I’m just writing this down so people would know that you can flash an ms28 drive using SB600. In the documentations I only found references that said that supposedly only VIA cards work. I have been using a Dell Vostro 1700 for 1 year now, so I thought I’d share some info about it. I bought this machine for gaming and work. It has great feature sets to do these tasks, but not too brilliant when it comes to mobility. It features a heavy chassis and heavy battery. This machine weighs a ton. It is very heavy because of the big screen, heavy magnesium alloy chassis and batteries. It is hard to carry around and requires a BIG case. Since it has a huge monitor and a very power hungry graphics card it eats up the battery very fast. My machine gets an autonomy of about 2 hours with a 6Cell battery using the Dell power profile, and in power saver mode with low back-lighting I can get out a maximum of 3 hours tops. However it is a rugged machine and most screws are held in metal instead of plastic, so you get the idea. I am a programmer and I run a lot of heavy processing environments like J2EE with such IDE-s running as Eclipse and Netbeans. I sometimes peak both memory and processor usage, but this configuration doesn’t really slow down nor hang or swap. It runs everything smoothly and quickly becomes responsive when coming back from stand by. I run Vista. I also used Ubuntu and LinuxMint for a while, ran fine, but power management was not really supported. Here comes the main reason I write this article. This rig is great for gaming. It runs most games just fine including newer ones. Sometimes you need to tweak the options since it wont really run everything in high detail, but if you find a balance between resolution and video features you should have no problems. Heat: the heat dispersion is great on this unit. My temperature sensor usually shows 40-45 C in normal usage. Peaks slightly around 55-58 C when running games, but it rarely reaches 60 C.
There is plenty room for overclocking but I didnt feel I need to commit to that. Especially in Crysis you will notice that a small overclock of just a few Mhz on the shader and memory clocks will result in very visible increase in framerate. This laptop is a definite go if you’re a gamer and want to play serious games on it. However if you have the money try to go for a Class 1 graphics card like the Quadro3700M. This laptop does NOT feature MXM, so you are stuck with the stock graphics card. These drivers are hacked from the official driver releases from nVidia and updated much more often then the DELL drivers. Getting an updated driver results in HUGE visible performance increase. For example: Crysis would barely run with the stock DELL drivers, and after the update from laptopvideo2go it ran perfectly. Same with BioShock! I just bought a bunch of low cost 4051 analog multiplexers for use with my Arduino. I am working on a MIDI controller so I will need a lot of input both digital and analogical ones, so the multiplexers will come in handy to do analog reading using as few of the analog pins as possible. As a first test I tried an adapter for a C64 keyboard, which has all keys placed in a 8×8 matrix of buttons. The idea came from arduino playground where they explain the usage of multiplexers. The following image fits the c64 keyboard like a glove, so just go ahead and build the one on the right. Here is my solution. It’s the same circuit only on a perforated board. If you have the skills to make PCB-s, I really suggest to doing so. Notes: make sure you click the SerialMonitor so you see some output. The above code will output the number of the key pressed. For more information concerning the keyboard layout of the c64 here is a schematic of the key matrix. I just got my Arduino last week, and although this is my first intro into electronics so I was very excited to get it and try out new things. It would be great to have something like this built onto the motherboard by default. My example would be if one wants to create a small usable midi controller (THRU) he will need IN and OUT so it can be added to the midi chain of synths and controllers. What I am trying to accomplish now is to interface two low cost arduinos based on the Atmega8 chip to multiply the IO operations one board can handle using just a few of the digital pins. My ultimate goal is to build a nice sequencer with MIDI In/Out/Thru using Arduino. I now have xbmc installed on my server, which is plugged into my monitor via a looong extension cable. Having a wireless mouse for controlling used to be OK, but it got kind of annoying to find a flat surface every time you wanted to pause the movie or browse through directories. So I thought it would be nice to attach an IR pickup and preferably use the unused buttons of my Samsung T240HD TV’s remote. When in PC monitor mode, the TV does not use it’s directional keys, OK, Escape and none of the Colored buttons, so mapping these would be perfect. You can get +5V from any of your power connectors, if you have a multimeter make sure you have the correct tension before connecting everything to your sound card. When everything is done, you can test it by enabling the Line-In playback on your PC and pressing some buttons. If everything is set up correctly you will hear strange noises when the IR receiver picks up any signals. Now for the fun part: using LIRC to map unknown IR signals to keyboard events. 1. Install LIRC using aptitude or whatever, and make sure the programs irrecord and irxevent are installed. This will fire up irrecord and you can name your buttons after each successful read. You will also get a new config file which contains the codes of your remote. When you push buttons on your remote, irx will look them up in your config file and display the appropriate events. All we need now is to map this input to keyboard events. You do this by using a program called irxevent. Once the lirc daemon is running, you can start irxevent by supplying a config file which contains the mappings: you need to create this file manually! Now test it: press some IR buttons and see if the keyboard events are fired. Yes, it is possible to build and run XBMC in Debian without too much hassle. Install graphics driver so when you run glxinfo you should see Direct rendering enabled. I did my build by excluding faac and pulse audio. This command will most likely FAIL at the first time you try it, so just get rid of the packages which are not found, and use a tool like aptitude to search for different naming. (lib in front of the name, and/or -dev at the end) My environment is very messy, so I am not sure which ones I had from different sources. Try running ./configure –disable-faac from your XBMC sources directory, and it will complain about what you are missing from the environment. If your lucky enough it might run, but I had several issues with it. For me the first fix was to re-run configure with disabled PulseAudio and faac. I got a missing function error here, so i changed the line of code in question(in the file the error was coming from). I guess my sqlite libraries are old, you might try updating yours. Next look for the LIBS=… line (around line 85) which contains all libraries and append: -lsmbclient to it’s end. Once make has completed successfully (will take a few hours on slower machines) you can install xbmc. Once you installed run it by typing “xbmc” in your terminal. I will try to keep this list updated as comments roll in with problems and solutions. Have fun using XBMC, and thank the guys and babes at xbmc.org for making such a cool software.